In some scenarios, you may need to create additional Order Desk stores to be able to manage all of your orders in Order Desk. 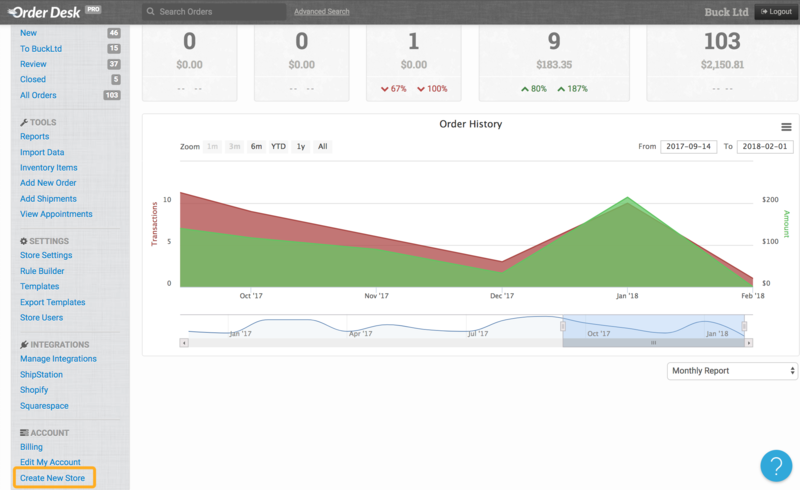 While you can connect to as many different integrations as needed on a single Order Desk store, a separate Order Desk store will be needed for each additional account you have for a single integration (two Shopify stores, two Etsy shops, etc.). Similarly, if you are a fulfillment provider, you will need to have a separate Order Desk store for each of your clients. Even though you may need multiple Order Desk stores, they can all be set up under one account with easy access to each store while you are logged into Order Desk. You can also copy or move orders from one store to another if you want all of your orders to eventually end up in one Order Desk store. This guide will cover how to create new stores, link the billing for multiple stores and how to move or copy orders between stores. 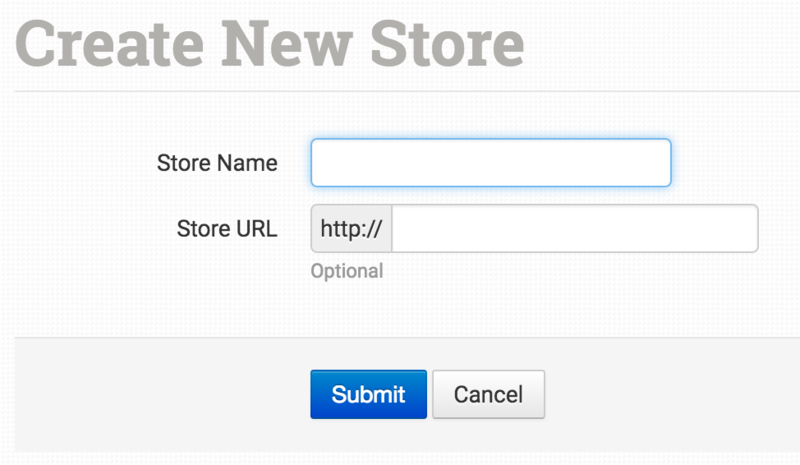 To create a new store in Order Desk, click on Create New Store under the Account menu in the left sidebar. Enter the details for your new store and click Submit. Create as many stores as you need, giving them names that are easy to identify. Once you have more than one store in Order Desk, you can quickly switch between your stores by choosing the store name from the dropdown at the top of the left sidebar. Each store you create will function independently from other stores on your account. The billing plan and usage will be determined on a per store basis. If you have multiple stores but would like to only receive one bill, you can link your sub stores to your primary store from the Billing page, which you can access by clicking Billing under the Account menu in the left sidebar. We recommend copying orders rather than moving them. Moved orders are completely moved from the original store and into the second store. Copied orders will stay in the original store and create a new order in the second store. Copied orders will automatically pull fulfillment details from the second store. Moved orders will not. With more than one store on your account in Order Desk, you may need to copy or move orders from one store to another. This allows you to work on or submit orders for fulfillment through one single Order Desk store rather than from each individual store. You may also want to keep all orders in one store for your records or as part of your workflow. 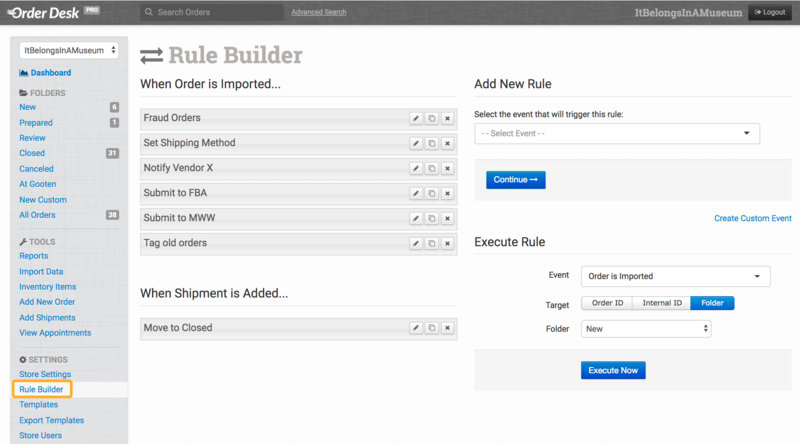 To copy or move orders, you will need to create a rule in the initial store where the orders are first imported. If you aren't yet familiar with the Rule Builder, head over to our Getting Started guide for more information. To create your rule, click on Rule Builder under the Settings menu in the left sidebar. From the Add New Rule section on the right, select When Order is Imported as the rule's event. You may need to add other conditions or actions, depending on your preferred workflow. In the second store, if you need to set up any rules to take actions on the orders, instead of using the event When Order is Imported, you will use either When Order Copied From Another Store or When Order Moved From Another Store. As orders are fulfilled in the second store, if they were copied into the store, the shipment details will automatically pass back into the original store to update the order. If the store and integration settings are in place for it, the fulfillment details will be sent back to the shopping cart and/or to notify the customer. Orders that were moved into the second store will no longer exist in the original store. Because of this, the link to the shopping cart will be broken and we will not be able to pass any fulfillment details back into the shopping cart. Moving orders is generally better for when you need to create an archive store and want to move old, already fulfilled orders into it.